I’ve got a way for us to generate an extra $100,000 for charity each month. FOR FREE. Imagine that every time you swipe your debit card, the debit card company donates 5¢ of their own money to charity. No round-up. No cost to you. That would be pretty sweet, right? A new company called Inspired is offering a revolutionary new way to do just that through their Inspired Card. It's my new favorite thing. I’ve had my Inspired Card since April. Since, then, just by swiping it as I otherwise would, I’ve unlocked donations to fully fund fourteen amazing projects on DonorsChoose.org. For those of you who don’t know what DonorsChoose.org does, it’s an AMAZING non-profit that helps raise money for classroom projects all over the country. They'll be onboarding new charities in the future, but for now, focus is on education so DonorsChoose.org is their current charity partner. IT’S THE COOLEST THING EVER. But even cooler: If everyone reading this post got an Inspired Card, we’d be able to generate over $100,000 for charity EVERY MONTH! Just by doing what we’d be doing anyway. At no cost to us. So picture this. You’re on your way to work and you grab a coffee from your favorite coffee shop. 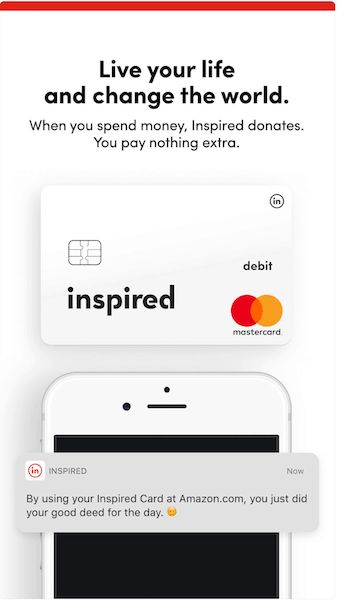 You pay with your Inspired Card, and you immediately get a little notification in your Inspired App showing you the impact you’ve made. Feels pretty good, doesn’t it? Like magic? Well kinda like magic. You see, when you swipe an ordinary debit card, the debit card company charges the merchant a fee to process the transaction. 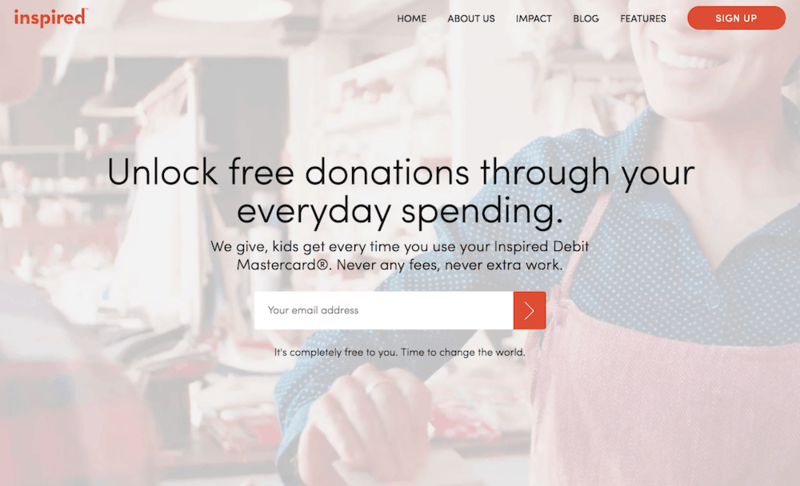 Inspired takes 5¢ from that fee to make the donation. It’s absolutely FREE for you and me. You don’t have to round up your spend with the cashier to the next dollar or anything like that. This is a no-brainer for people like us who like free, easy ways to help others. In fact, if we don’t do it, it’s just like leaving free money for charity on the table. I’d much rather have these transaction fees go to charity than to a processing company. 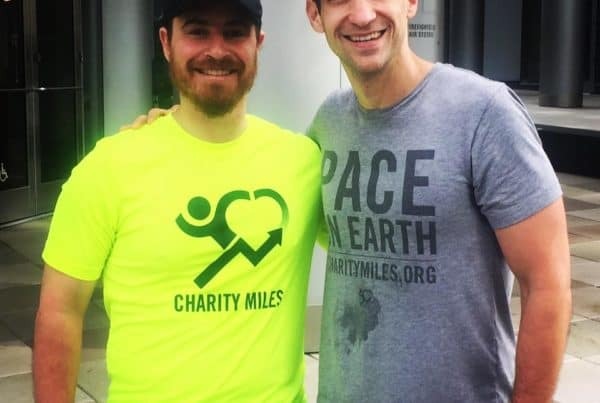 Like Charity Miles, Inspired’s founders are on a mission to make charitable giving easy and free, without asking people to do anything they wouldn’t normally do. I first met Inspired’s Founder, Stephen Ready, two years ago at a conference. When he told me what he was building, I couldn’t believe it. I say that both figuratively and literally-I wasn’t quite sure he could pull it off. But he did! I was so psyched when he asked me to be one of the beta testers. And I’m so psyched for the opportunity to share this opportunity with all of you. You might think that it doesn’t get any better, but it does. For every person who signs up through this link, Inspired will pay us a very generous referral fee. The feeling is mutual between us, and they love what we're doing and want to support us too. So, they'll be paying us for all the good people (like you!) that we send their way, which means that we will have more money to support our charity partners in Charity Miles. We’d be doing this even if they weren’t paying us to help because we truly love Inspired, but since they want to pay it forward, we’re glad to accept it! 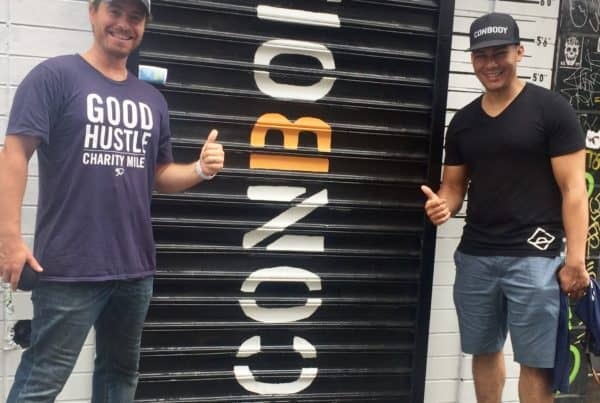 It’s a synergistic partnership that enables all of us to make a much bigger impact for charity. Kind of makes you want to tell your friends too, right? Click here or the button to sign up below. Then, share this link with your friends and multiply the good you do with your swipes while you’re at it. Inspired won’t mind! 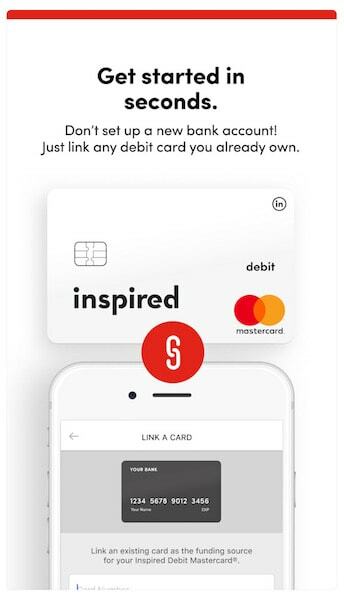 To start using an Inspired Card, all you need is an iPhone and U.S. bank account that currently has a debit card linked to it. No need to open a new bank account or do anything complicated. First, click here and order your very own Inspired Card for free. Once it arrives, download the Inspired app and link it to your regularly used debit card. Then, just use your Inspired card as you would use your usual debit card. Each time you swipe it, you earn 5¢ for charity. Again, this is totally free for you! Every time you spend using your Inspired Card, the merchant pays a fee (called interchange) to the Mastercard payment networks. Inspired acts as an intermediary here and receives a 5¢ portion of this fee which they donate on your behalf. How Secure Is The Inspired Card? The Inspired Card is backed by Mastercard. Therefore, it is not only FDIC insured but also protected by the Mastercard® Zero Liability Policy. Which means your funds are federally protected and available for your use from the bank reserves and you won’t be held liable for any unauthorized transactions made when the card is used . If you’re into doing good without going out of your way to do it, using an Inspired card to do it is a solid, secure and easy way to do so. Here’s a simple checklist to get you started.